A View From Above - Bear Camp Cabin Rentals. "A View From Above" is the perfect name for this 2-bedroom condo located only minutes from the parkway in Pigeon Forge. If you are wanting to be close to all the area attractions, have an unbelievable view, and get away from the hustle and bustle of everyday life, then "A View From Above" is the perfect place for your next vacation. "A View From Above" is a gorgeous 2-bedroom 2-bathroom condo that will sleep 6 and is located on the 6th floor, but you don't need to worry, there is an elevator for your convenience. It is located in the Big Bear Lodge and Resort where you are only minutes from the parkway in Pigeon Forge, 5 minutes from Dollywood and Dollywood Splash Country and 15 minutes from Gatlinburg. The resort has plenty of attractions of its own. It has the indoor pool which is open year-round for those who enjoy swimming in the winter or relax in the indoor hot tub after a long hike or if you like the warmer weather they do have an outdoor pool with an outdoor hot tub for your enjoyment during the summer. There is also an exercise room with cardio machines for those who like to work out. If you want to stay around the condo there is also a game room with an air hockey table and a foosball table. As soon as you walk into "A View From Above" you are going to be amazed by all the comforts of home and the spacious floor plan. If you enjoy cooking there is a fully equipped kitchen with granite counter tops and with the open floor plan you can enjoy the amazing view of the Smokies while you cook or watch your favorite sports team on the Flat screen TV in the living room. You will have dining for 4 at the table with an extra breakfast bar that seats 2. After a long day at Dollywood, come back and kick your feet up on the comfortable sleeper sofa or relax in the chair with a good book. On those cold winter nights, curl up with a cup of hot cocoa in front of the electric fireplace and enjoy catching up with family and friends. If you like being outside, just through the sliding glass doors is a large covered balcony where you can enjoy the 2 wicker rocking chairs while taking in the view of the mountains or gather around the outdoor patio table with 4 seats to enjoy a cup of coffee while planning your next adventure in the area. Just off the living room is the Master suite with a beautiful King size bed, Flat screen TV, with access to the large covered balcony for those of you who like to enjoy a nightcap before heading to bed. You also have your own large, lavish private bathroom with a double sink granite vanity, a jetted tub, and a 7' walk-in shower. Wait until you see it!!!!!! Adjacent to the kitchen is the 2nd bedroom with a lovely King size bed and Flat screen TV. Just outside the bedroom door is a nice size bathroom with a granite vanity with a tub/shower combination. Also, just across from the bathroom is where the washer and dryer are located for your convenience. If you are looking for convenience, an unbelievable view, and relaxation then "A View From Above" is the perfect place for your next mountain vacation. What are you waiting for? Book this gorgeous condo today before it is too late!!!!!!!!! 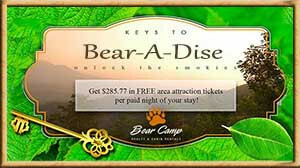 We were very pleased with our rental process and stay with Bear Camp Rentals. The condo was wonderful! It was very clean and we had everything we needed.